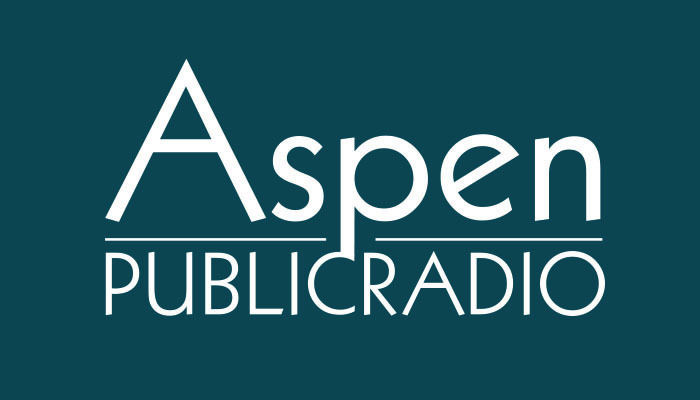 On Tuesday, Aspen voters will decide where new city offices will be built. One possibility, "Option B" would put a new building on Rio Grande Place. Opponents say this option will reduce open space, but neither of the two options effect open space. “One thing people don’t realize about Option B is it’s three stories, there’s no height limits,” said Aspen city council member Bert Myrin, who doesn’t want to see a new building on Rio Grande Place. 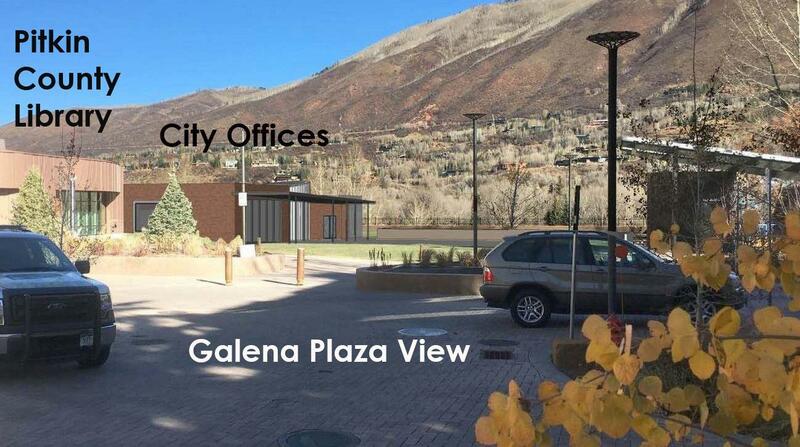 The top floor of the new office building would be on Galena Plaza, the park in between the library and the jail. “Open space is a very technical term and the Galena Plaza is not open space. It’s the roof to the parking garage,” said Jack Wheeler the Capital Asset Director for the city. Wheeler has been overseeing a potential Rio Grande building for years, what is now called Option B. The park is not classified as an “open space,” like the Marolt. 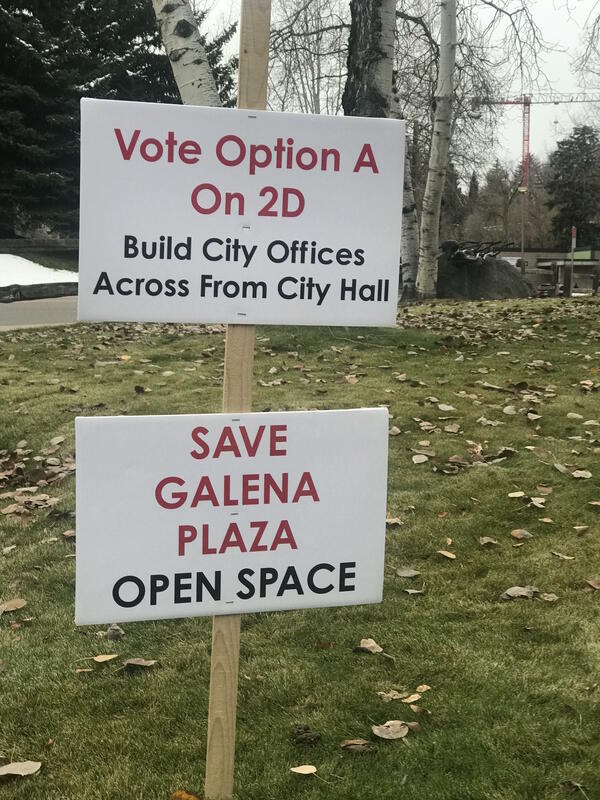 Calls to save Galena Plaza open space have been put on signs around town and handed out to Aspen voters. Austin Weiss is the Parks and Open Space Director for the city. He gives the example of the Marolt Open Space as a property that is classified in this protected way. His department takes does care of Galena Plaza, but he says it’s a different category. “We manage it and maintain it, but it’s not really open space in that same light as undeveloped, untouched native landscape,” Weiss said. Weiss and Wheeler also point out that under the Option B proposal, the grassy area of Galena Plaza would expand. “The plan for city offices that would be built there include enlarging that area by 40 percent,” Wheeler said. A flier campaign went out to Aspen voters with the same language about saving open space, implying that Option B would take away open space. “It’s a lie,” said Wheeler. Myrin concedes that what is at risk is not open space itself. “It’s the views that are being taken away from the open space more than the open space being taken away,” he said. He’s concerned that the top story of the new building would block the view of Red Mountain from the upper entrance to the library. He says that floor would be about 7,000 square feet. “When you add a 7,000-square-foot building it’s hard to look right through it, so the views will be a threat for that,” Myrin said. But the campaign flies and posters don’t say “save the views,” they say “save the open space” and Jack Wheeler is worried that will mislead voters. “What my hope is is that the community gets informed and makes an informed decision, not based on the rhetoric and lies that are going around,” said Wheeler. On Tuesday the Aspen City Council decided to extend a contract with developer Mark Hunt to buy two buildings near city hall.